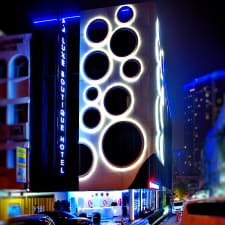 PJ-Luxe Boutique Hotel is a 27-room modern boutique hotel with many artistic elements in its design and with special lightings. The hotel is unique and in a class of its own. Our staff are friendly and warm. This is a great hotel for both business and leisure travel. Situated in a heart of Petaling Jaya, the hotel is close to varierty of restaurants, banks, 24 hour outlets and park in jogging. Proximity to Asia Jaya & Taman Jaya LRT Station makes for easy access to the center of Kuala Lumpur. Situated in Petaling Jaya in the Selangor Region, 7 km from KidZania Kuala Lumpur, PJ-Luxe Boutique Hotel boasts a terrace and sauna. Guests can enjoy the on-site snack bar. Each room at this hotel is air conditioned and is fitted with a flat-screen TV with satellite channels. You will find a kettle in the room. All rooms have a private bathroom. For your comfort, you will find bath robes and slippers. University of Malaya is 1.8 km from PJ-Luxe Boutique Hotel, while Sunway Lagoon is 5 km from the property.